I’m a West Virginian at heart. I’ve had a love affair with the verdant and rugged topography of the Appalachian Mountains my entire life. I’m a firm believer that, with the bullet-hard sandstone of the New River Gorge, the trifecta of the Cheat, New, and Gauley rivers, and the technical mountain biking in Canaan Valley, we’ve got world-class everything right here in our backyard. My girlfriend, Nikki, feels the same way. Neither of us pines to live in Boulder, nor do we feel any reason to join the gentrification movements taking place in many western recreation hubs. We’re happy living simply in the gritty communities of these green West Virginia hills. But that doesn’t mean we don’t love it out West. What it lacks in terms of verdant jungles and abundance of water, it more than makes up for with multichromatic mountain vistas, towering pine forests, and that famous Big Sky feeling. While our home base remains in the subtle hills of the county’s oldest mountains, we make it a point to play on the other side of the Mississippi at least once a year. We flew out to Portland to embark on a two-week excursion through the Pacific Northwest. Here are the highlights. With a fresh supply of stoke after an airborne view of Mount Hood, Nikki and I arrive in Portland. Armed with an ambitious agenda, we link up with my friend Lee to road trip to the tiny mountain town of Happy Camp, California—a Bigfoot-obsessed recreation hub tucked off the beaten path in the rugged Klamath Mountains. As we trade the stifling traffic in Portland for the wide-open country of the Willamette Valley, we are unable to see much of anything. Lee informs us that smoke from a fire up in British Columbia has made its way down into Oregon, and that we likely won’t catch a glimpse of Hood anytime soon. Although we maintain naive hopes of clear skies, we eventually find that ubiquitous wildfire smoke will become the unwelcome fourth member of our crew. We start the long climb up the State of Jefferson Scenic Byway, the border-crossing mountain road that ascends Grayback Pass and is named to commemorate the 1941 movement when, ever so briefly, six counties in southern Oregon and northern California fought to secede and become the 51st state. Snaking around hairpin turns in the dark, headlights illuminate the forest, and the familiar smell of dry soil and pine resin fills the cabin. It’s just enough stimuli to unleash a rush of memories, and it’s good to be back out West. We arrive at Kelly Lake around midnight. Just 20 miles northwest of Happy Camp, Kelly Lake is the most accessible mountain lake in the Siskiyou Wilderness Area. It’s late, but the stoke is high, and we hike to the far side of the lake to set up camp, strike a fire, and have our first beers in California. Lying on the lake shore, looking up at a few stars through the hazy sky, the three of us swap stories while our fourth wheel hangs lightly in the evening air. The high-pitch whine of mosquitoes in my ears becomes consistent enough to spark consciousness. I flop over, and the scents of fire smoke and fresh pine fill the air as my eyes come into focus. Towering sugar pines stretch toward the hazy morning sky like fuzzy torpedoes. I sit up and peer through the ground scrub toward the lake shore; concentric circles of water extend as trout breach the glassy surface and an Osprey circles overhead. There's nothing quite like sleeping in the open air—something we tend to avoid in the rainy climes of Appalachia. We pack up and head down the mountain into Happy Camp. A town of just over 1,000 people, Happy Camp is a strange place to say the least. Steeped in history and exuding a pioneering vibe, Happy Camp is an old logging town that doesn’t have much of anything left, which is exactly what makes it so charming. 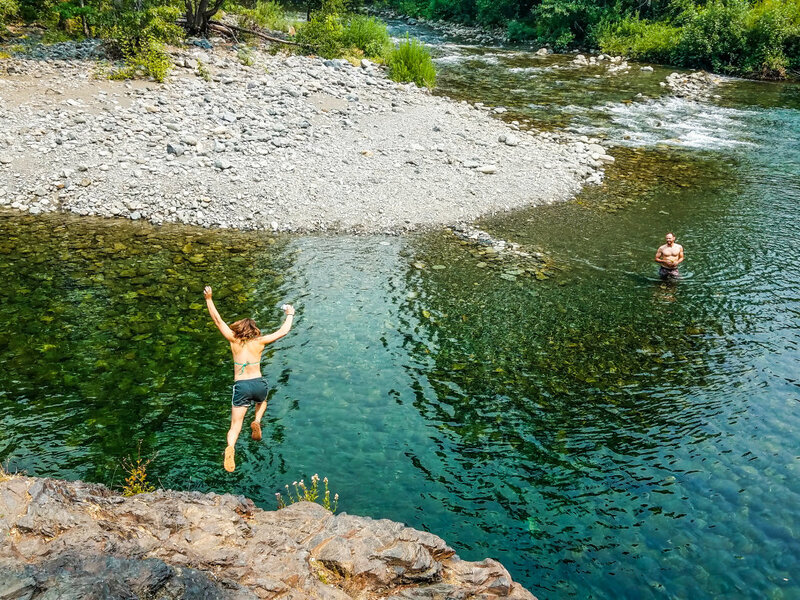 It’s the gateway to the surrounding wilderness of the 1.7-million acre Klamath National Forest, and it is located centrally along a superb whitewater stretch of the 263-mile Klamath River, making it an ideal launch or stopping point for single- and multi-day raft trips. We’re up early the next day to paddle the Klamath with Dave Payne, the United States Forest Service River Ranger who’s been contributing to river conservation on the Klamath for three decades and still paddles with the fervor of his younger years. 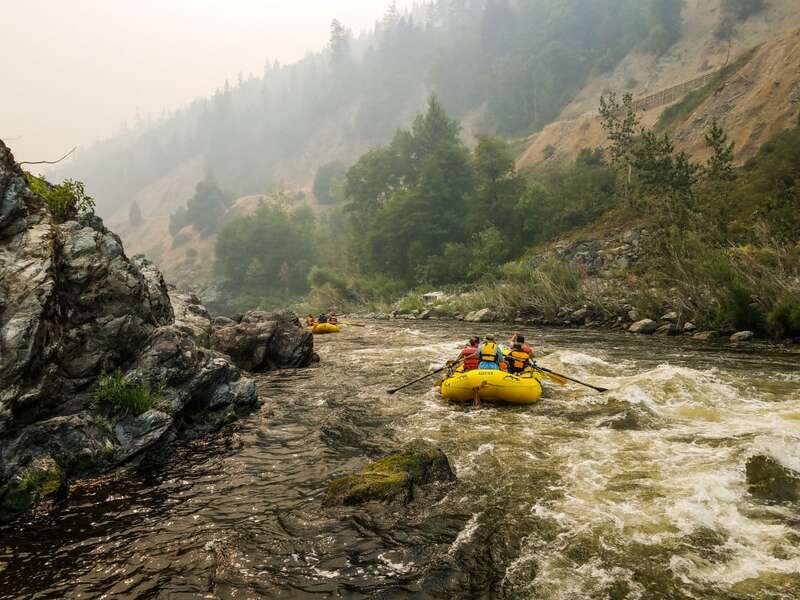 The section of river that slices through the Klamath Mountains is filled with exciting class III and VI rapids, stacked with spectacular canyon scenery, and attracts paddlers and packrafters from around the country. Our crew decides to paddle individually in duckies—inflatable kayaks—and we put in at Indian Creek to run a series of rapids, including the famous class III Rattlesnake. It’s Nikki’s first time in a duckie, and her apprehension disappears as she successfully bounces through the first rapid with giggles and a wide smile. It’s a bizarre day on the river. My previous trips down the Klamath always involved a bluebird sky and crisp views of the massive forests and rocky peaks surrounding the river. Today, we’re lucky if we can see a few hundred yards down the canyon. The smell of smoke is thick, and ash softly falls like apocalyptic snow. I want so badly for Nikki to experience the Klamath in all its glory, but wildfire is a part of the landscape here, and we decide it’s fascinating to experience the river during such an event. A few miles down the river, I see Lee on the river bank. He’s spotted an unintentionally trapped an immature bald eagle that was drying off under the willows after an unsuccessful attempt at a fish. I paddle up, and float, totally in awe, just a few feet from an apex predator. After lunch and some scouting, our crew runs Rattlesnake successfully, avoiding the big hole that would wreak carnage on anyone unfortunate enough to get sucked in. We stop for a river board surf session at the Endless Summer wave before wrapping up our day. The fires are bad enough to force us to the coast. We cut our Happy Camp plans short and head west, driving through both wildfires. Firefighters are staffed along Highway 96, ready to remove any smoldering debris that falls on the Klamath River Highway from the hot spots on the mountaintops. An hour or so later, we finally escape the fire’s reach. We gleefully kick the fourth member of our crew out and relish in the scenery unfolding before us. Forested mountain peaks stretch into infinity, and the full spectacle of Klamath country comes into view. We climb out of the Klamath’s drainage and crest over bald hills, earning our first view of the Pacific from way up high. With anticipation, I stare into the passing forest—the redwoods should be appearing. We drop down a steep series of switchbacks through the cathedral of a redwood forest. The closest thing we have in Appalachia are the isolated stands of old-growth red spruce, and even they pale in comparison to the world’s largest trees. A plant biologist, Nikki’s eyes light up like those of a child on Christmas Day. But we’ll save a hike in the redwoods for another day—we’ve got to make it to Lost Rocks. 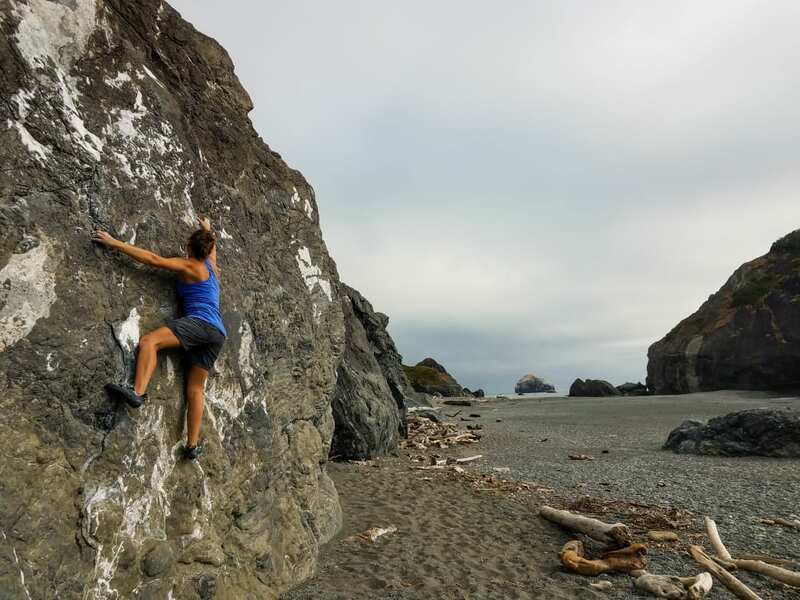 Located just south of the mouth of the Klamath River, Lost Rocks is northern California’s premier coastal bouldering zone. While the majority of crags along the Pacific coast are comprised of crumbly rock, Lost Rocks is a concentration of bullet-hard metamorphic rocks—venerable needles in the geological haystack. Because most of the boulders are surrounded by pebbles and flat landings, you can get away without a crash pad to soak up minor falls. We throw our climbing shoes in our backpacks and descend the steep hillside to the beach. We climb the afternoon away, taking breaks between the challenging routes to browse driftwood piles, toss Frisbee, and stoically stare at the ocean. The setting is unlike anything you can find on the eastern seaboard—the aesthetic factors that make Lost Rocks unique are as good as the climbing itself. After sunset beers, we set up camp in the cool coastal fog. Although our plan is to drive up the Oregon coast via Highway 101, we make a morning detour inland from Crescent City to walk among giants in Stout Grove. We take the scenic route on Howland Hill Road from the south—a five-mile dirt road that sneaks along a lush ravine and between majestic redwoods pushing the boundaries of the road ever closer together. Situated on a flat along the gorgeous Smith River, Stout Grove is one of the most scenic redwood groves in northern California, and the crown jewel of the Jedediah Smith Redwoods State Park. 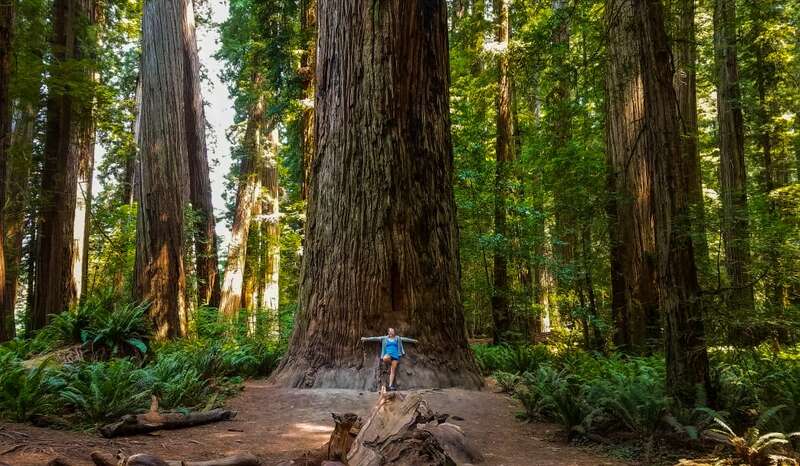 Although there are bigger, taller, and older trees in other groves, Stout Grove is known for its natural park-like setting and relatively open forest floor, making it feel like a wooded cathedral. The small loop trail within the confines of the grove takes visitors right past the Stout Tree, the grove’s largest. Nothing induces a feeling of sublime insignificance like standing among giants as soft afternoon light filters through the towering canopy. Thick carpets of redwood sorrel and gardens of five-foot tall ferns add to the mystical Jurassic feeling of the grove. As I walk along the trunk of a fallen giant, I fully expect to see a brontosaurus come lumbering through the grove. Following the ultra-scenic drive north up the Oregon Coast on Highway 101, we’re back in Portland. After a few days of pretending to be civilized urban folk, Nikki and I decide we need some fresh air. Effectively doubling as our chauffeur and tour guide, Lee picks us up once again to knock out an evening hike in the Columbia River Gorge. I inquire about Multnomah Falls, the 627-foot, two-tiered waterfall that serves as the centerpiece of the gorge’s stunning series of falls. 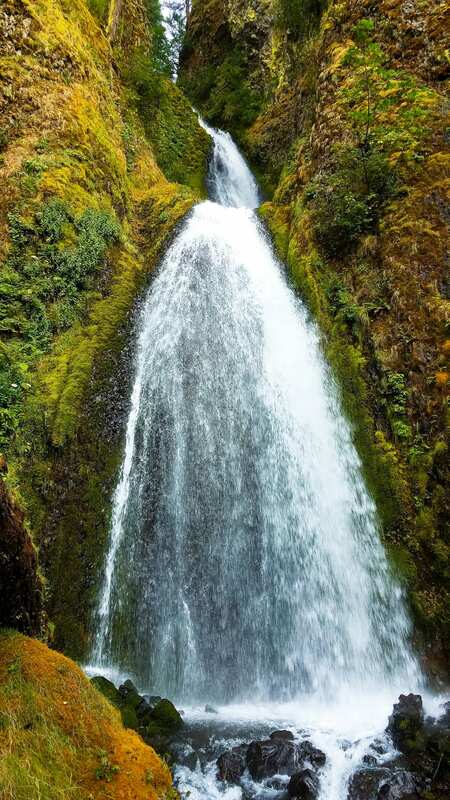 Lee suggests Wahkeena Falls, a 242-foot set of falls that is just as enjoyable. 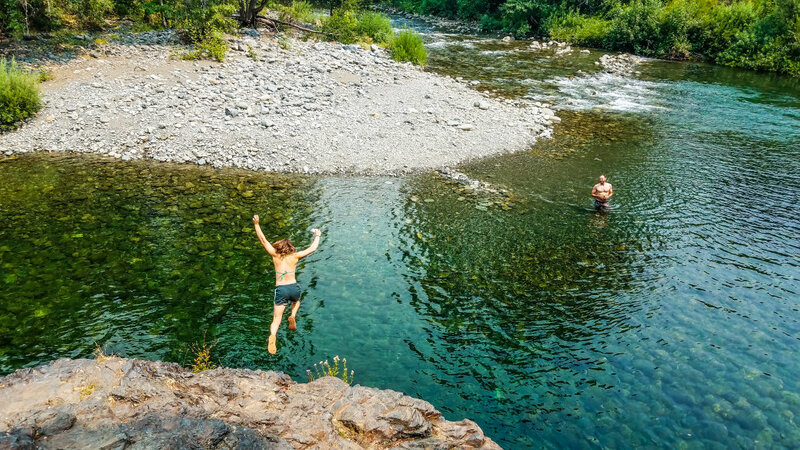 While Multnomah certainly steals the thunder in the gorge, it also attracts the majority of visitors. Given that we tend to dislike crowds, we eagerly sign on to Lee’s plan. We began our steep ascent up the gorge, passing the main drop of the falls along the way. A jet of frigid air and gentle mist helps regulate our body temps before we continue up the trail to meet Fairy Falls, a gorgeous, gently fanning cascade. Nearly 2,500 vertical feet later, we’re on the rim of the gorge. Looking out from a craggy overlook, the canopy of fir and pine trees drops into oblivion. 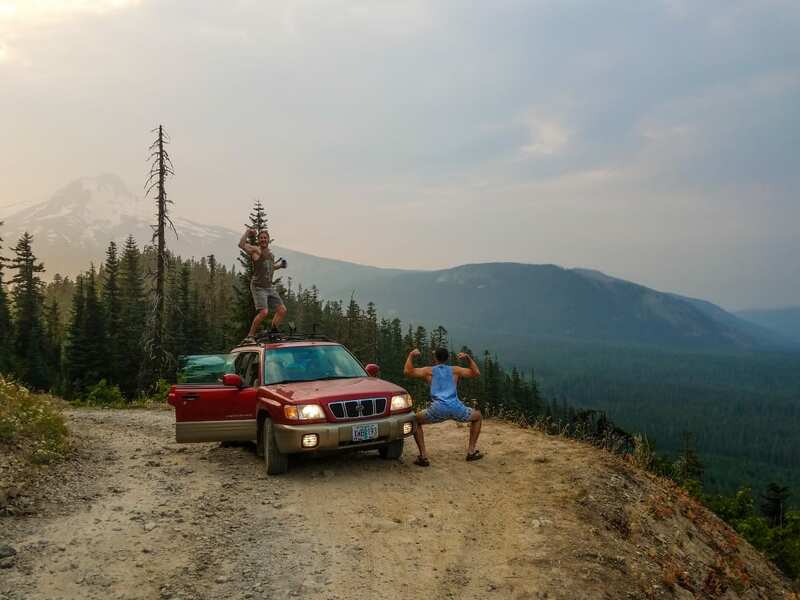 Unfortunately, the fourth wheel we ditched way back on the Klamath River Highway has latched on to our crew once again—thick smoke completely blocks what should be an awe-inspiring view of the Columbia River Gorge, and the volcanic peaks of Mount Saint Helens and Mount Adams. We head into the majestic old-growth forest on the rim for the Devil’s Rest loop that will drop us back onto the Wahkeena Falls Trail. While not nearly as big as the redwoods, the massive Douglas firs remind us just how special it is to be among such ancient beings. Filtered by the distant smoke, the light of the setting appears even more fiery than usual. Dropping down the west-facing slope of the gorge, we’re treated to a spectacular light show before hooking back up with Fairy Falls. After the epic descent, we return to an empty parking lot with sore knees and lifted spirits. There’s something rewarding about being the last ones out. 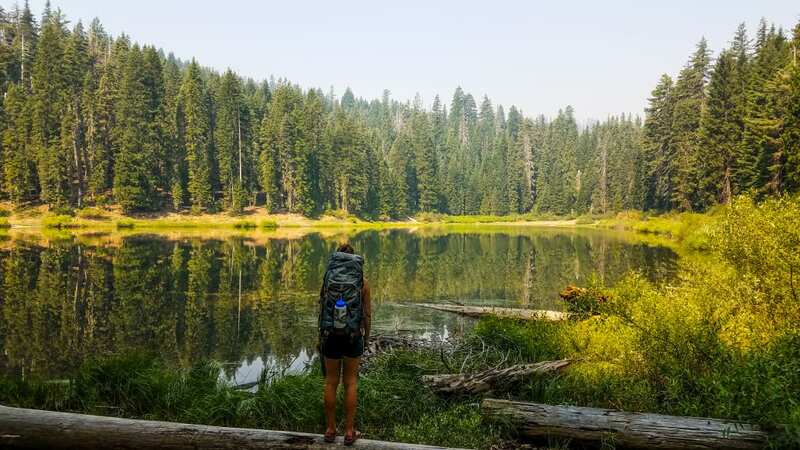 With just two nights remaining, Lee is adamant about taking us to camp at Bonney Meadows—an obscure campground in the Mt. Hood National Forest that’s quite challenging to get to. If you want to see what your rig is capable of, test your comfort level on the insanely rocky path of FS 4890—a sketchy unimproved road cut along a rocky mountainside that leads to the campground. I would shout the disclaimer that high clearance is an absolute prerequisite here, but Lee claims he once carefully navigated the road’s uneven tracks and basketball-sized boulders in a Honda Civic. As an amateur astronomer, I try to sync outdoor activities with cosmic events. Fortunately for us, the annual Perseids meteor shower is scheduled to peak on the Saturday night of our camping trip. The plan is to make a dusk trek to the summit of 5,580-foot Bonney Butte, where a 360-degree view—including a spectacular look at Mount Hood—should afford us prime sky watching conditions. We whittle away the day with a pleasant hike down to low basin of Boulder Lake. A kind group of campers lends us their inflatable raft, and the three of us paddle around the gorgeous lake. Frequent dips in the chilly waters make the heat of the beaming sun bearable. The skies are clear, the smoky haze is dissipating, and meteor prospects are looking good. We rush to make dinner in anticipation of our cosmic plans. But, just as we finish eating, clouds roll in. The few stars visible instantly disappear; flashes of light and rumbles of thunder taunt us in the distance. Just as darkness falls, it begins to rain—according to Lee, it’s the first rain in nearly 60 days. We toss our yardsale of gear on the picnic table in the car and huddle in the tent. Nikki and I have a tough time shaking the disappointment of yet another obscured view, but we focus on the positives. We’re dry and warm with full bellies, full beers, and good company. Things could be worse. We board our return flight and reflect on the trip. Sometimes things seem to fall in place perfectly. Sometimes you don’t get what you want. Other times, it seems as if the powers that be are conspiring against your every move. We left the rainy Appalachian summer in anticipation of blue skies, epic views, and stargazing. Wildfire and rain made sure we got none of that. We grab our backpacks from the baggage claim and exit the Pittsburgh airport into a dark night. I look up. The sky is clear and the stars are plentiful. I think back to the great times with friends, new and old, sharing stale stories and fresh experiences while paddling raging rivers, climbing coastal boulders, and exploring majestic forests. I smile. It turns out we got exactly what we needed. Written by Dylan Jones for RootsRated.